The two-stage system operates at low heat most of the time and automatically modulates to higher heat production if the temperature drops. Run the high efficiency fan continuously to improve indoor air quality. The variable-speed motor can also help increase comfort by maximizing moisture removal during cooling operation. Energy-saving high efficiency operation of 95% AFUE. Two-stage operation system reduces temperature and humidity swings in the home by heating and cooling more evenly. HELP® (Homeowner’s Extended Labor Program) available. 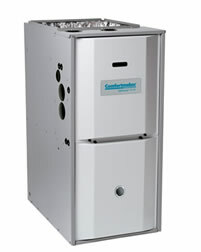 The Comfortmaker® SoftSound® VC 97 Variable-Speed Modulating Gas Furnace featuring the Observer™ communicating system is designed to take your home to a new level of comfort and efficiency. Teamed with our Observer communicating wall control and the appropriate air conditioner and indoor coil, the SoftSound VC 97 functions as part of a complete communicating home comfort system. Various components of the system “talk” to each other electronically, fine-tuning comfort levels while maximizing energy savings.